It’s a new year! A time for contemplation and change. Many times we decide right about now what we want to do better for the next year. How we can improve our routine or better take care of ourselves. This year, we want to create revolutions, not resolutions. The Non Toxic Revolution is about informing, educating, and inspiring young people to revolt against the dangers of toxic chemicals in their environment and food supply, especially those linked to the initiation of cancer. One of the biggest ways to revolutionize your daily routine is to switch your deodorant to a more natural option! Did you know that the best detox method doesn’t cost any money? It’s true! The best detox is our very own sweat. You just have to let it out! That’s why this revolution is so crucial to our health. We use deodorant everyday, so it’s super important that we rock out with the best ingredients for our underarm skin & ditch the ones with zero chill. It’s no mystery by now that deodorants containing synthetic chemicals and sweat blockers (looking at you aluminum) aren’t doing us any favors. Many synthetic deodorants have filler ingredients that really don’t do anything for us, and some can even harm us in the long run. Ingredients that have been linked to hormone disruption, allergies, skin irritations, reproductive toxicity, and even cancer. What can you do about these not so great ingredients? Check your labels! Get familiar with ingredients you are seeing on many of your products, if they match any of the ingredients in the graphic below, consider switching to a product that cares more about your long-term health. 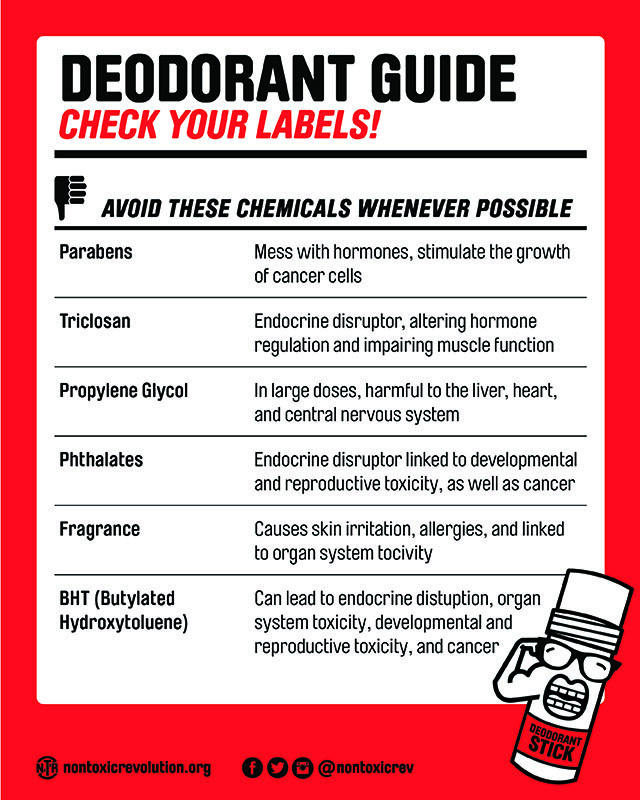 So, we cut out the ingredients that are harmful to our pits, but will the deodorant work now? The right combination of clean ingredients can give you the same effectiveness as the synthetic deodorants you're used to grabbing off the shelf. We promise! Yes, it may take some time to find the deodorant that matches your body chemistry, but you can do it. What happens when you switch to natural deodorant? For many people everything is great, the switch is super easy and they are happier and healthier right way. For some, it’s a process. We want to be upfront with you, finding a natural deodorant that works for you might not be a walk in the park at first, it can take days or even weeks for some. You may notice that sweat even more at first, but that’s just your body releasing a build up from the aluminum-based antiperspirant you’ve been using. Maybe you stink a bit more, the same applies in this situation. You’re body is letting it all out and sometimes that includes odor-causing bacteria. You may even experience some increased sensitivity in your underarms during this process due to your lymphatic systems releasing the increased amounts of bacteria. I know, is it worth it? It really is! We want your body to function the way it needs to in order to keep you as healthy as possible, and this means it needs to sweat sometimes. If you experience these effects, give it time and they will subside. Then your body will LOVE the non toxic ingredients. You may even find that you smell and sweat less with the switch to natural. Sounds silly, but there are a few things that can help the natural deodorant transition. Yes, you still swipe it on your armpit, but you can apply too much and that can cause some issues. You may feel inclined to over apply because you’ve heard that natural deodorant doesn’t work, but this can cause sticky underarms or stained t-shirts. Start with a couple swipes and go from there. Watch Out For Cuts. Abrasions to your underarms from shaving can cause irritations if you apply deodorant too soon after shaving. Make sure the natural deodorant absorbs before going on with your day. Heat up the deodorant tube or jar with your hands at first to get it soft and ready to absorb into your underarms. You don’t want to apply to harshly or not apply evenly because this could lead to underarm irritation. And giving your new deodorant a few minutes to absorb can also help prevent stains. You Can Make The Switch Right Now! We are so passionate about you making the switch to natural deodorant this year that we asked some of our partners if we could offer you their products right here on our site. 100% of the sales of these deodorants go towards our program and to making your pits happier and healthier. We believe in all these brands and think you can find your non toxic deodorant right here, right now. Check out these natural deodorant options and visit our store for other scents!